Crock Pot Bacon Mushroom Swiss Chicken - Recipes That Crock! This Crock Pot Bacon Mushroom Swiss Chicken from Gooseberry Patch’s Everyday Slow Cooker is a flavorful combination that you don’t want to miss! Michael loves mushrooms. I do not (unless you are talking about morels!). It would have been SO easy to just make this a bacon Swiss chicken, but I know how much Michael loves these flavors combined, so Crock Pot Bacon Mushroom Swiss Chicken it is! Psst… Cris here… WE LOVE this recipe too. So much so that Mikey made a cooking show video for it AND a quick cooking video! Note: Scroll to the bottom of this post for a printable version of the recipe. If you have a picky eater in your house, let them know that this picky eater still enjoyed this recipe thoroughly. (I may or may not have picked out the mushroom chunks in mine…I’m not tellin’! ???? ) The melty Swiss combined with the yummy bacon…and okay, the flavor of the mushrooms…were awesome with the chicken! 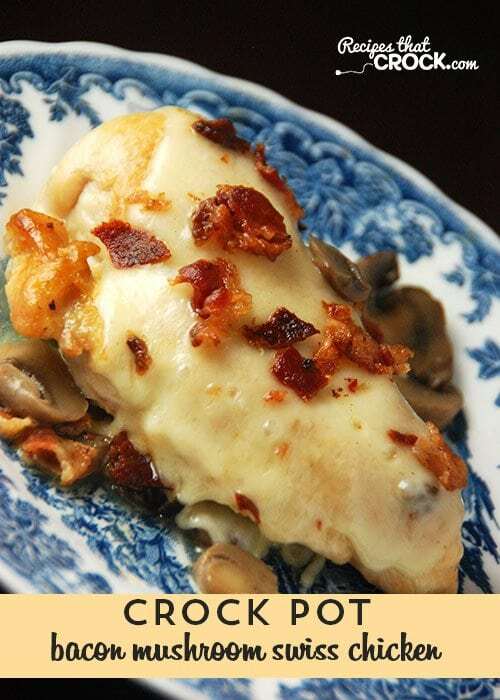 How to make Bacon Mushroom Swiss Chicken in a slow cooker. We love cooking with meat thermometers to ensure the that our chicken is done but not overdone. Note: If you have trouble viewing this video, click the button below to view on YouTube. 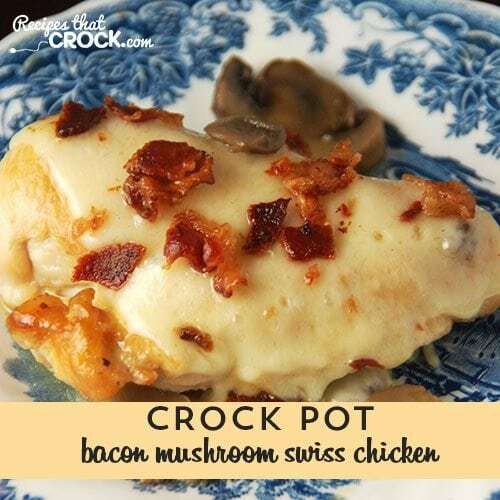 This Crock Pot Bacon Mushroom Swiss Chicken is a wonderfully flavorful combination! Don’t like canned mushrooms. Any idea what would be the best way to add fresh mushrooms? I haven’t tried this with fresh mushrooms. If I did, I would slice them and add them at the same time as you would add the canned mushrooms. Let me know how it goes! Enjoy! Could I use Mozzarella cheese in this instead of Swess?? I have not tried this out in my casserole crock pot yet, so I can’t say for sure how the timing would chance. You will want to try it out the first time when you can keep an eye on it to know how your casserole crock cooks it and how the timing needs adjusted. Enjoy! This meal was so yummy! I prepared this dish before I left for church this morning and when we got home (31/2 hrs later) it was ready for the cheese and bacon. The whole house smelled wonderful and it was delicious! Thank you so much for sharing! I’m so glad your family enjoyed this as much as we did! It really is the perfect timing to throw on before you go to church and have lunch waiting on you when you get home! Could you cook this meal longer than four hours? I work a 7 hour day, typically. This recipe might best be tried on a weekend. I am afraid cooking it for 7+ hours might result in an overcooked meal. If you want to give it a shot for a longer time, you could put a baking dish inside your slow cooker and fill the dish with the recipe. Then, pour water into the crock until it hits about halfway up the outside of your baking dish. That method may buy you some time. I would still recommend cooking it the first time that way on a weekend when you can watch it to see how long it takes though. Hope that helps! Are you suppose to leave the bacon grease in the skillet when you warm up the soup? You do not drain the drippings. There wasn’t much left after browning the chicken, but it helps to add a nice flavor to the soup. Enjoy! There is nothing better than having dinner ready when you get home from work. This is definitely being added to my Pinterest Board and my home recipe file. Thanks!